HANSON — Paul and Jennifer Skarinka received the keys to their new home on Tuesday, April 2. 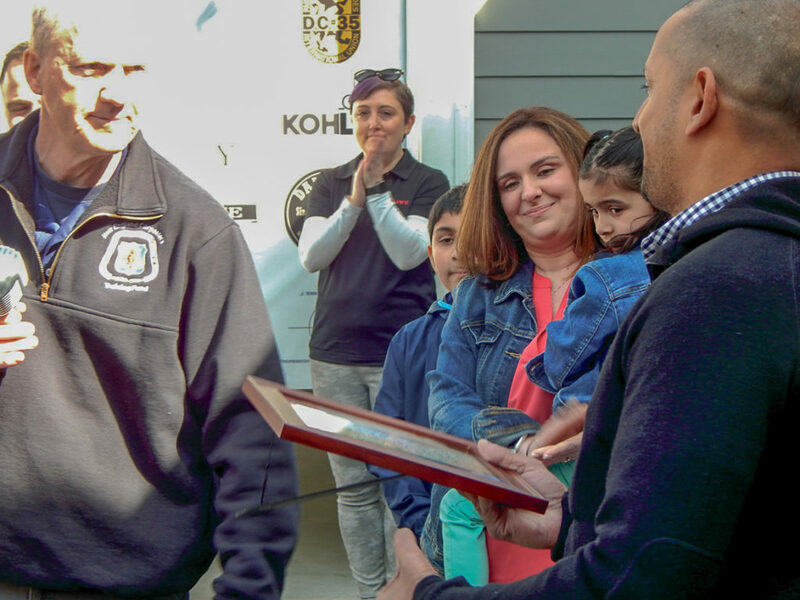 The occasion, exciting for any young couple, was different than most — is a mortgage-free, injury-specific house built through Jared Allen’s Homes for Wounded Warriors for a veteran injured in action. It was delayed a few months due to record-low temperatures, record flooding, microbursts that knocked out power for nine days, three nor’easters, delays caused by a moratorium following the Merrimack Valley natural gas explosions — and vandalism — but the Hanson community joined builders, trade union representatives and Allen to welcome Skarinka, 39, and his family to his new home. Skarinka, an Army veteran who lost a leg and sustained severe injuries to his left arm when his unit came under attack on a mission in Sadr City, Iraq in September 2004, said he and his family are thankful for their new home and the help of Hanson police and fire departments after the project was vandalized over the winter. Jennifer Skarinka said the house means her husband will be able to find comfort at the end of his working day. Allen, a five-time NFL Pro Bowler, said his foundation is a way to give back to those who defend our country. Veterans go through an application process and other veterans’ organizations “lead the way” to his program, Allen said. Skarinka also had the good fortune to be a friend of Alex Karalexis, a 1992 W-H graduate and Hanson native, who is executive director of Jared Allen’s Homes for Wounded Warriors. Veterans have say in where they want their homes to be located and work with architects and designers in creating their homes. Allen said the vandalism was horrible, setting the project back weeks and costing money. The Skarinkas had originally planned on moving in for Thanksgiving or Christmas before the vandalism to windows in the home. Other Hanson officials present included Veterans Agent Timothy White, Town Administrator Michael McCue, Police Lt. Mike Casey, Fire Chief Jerome Thompson Jr., Deputy fire Chief Robert O’Brien Jr., Superintendent of Schools Jeffrey Szymaniak and Assistant Superintended George Ferro. Several officials from the Plympton Fire Department also attended, wearing their dress uniforms. Several representatives of building trades organizations also attended. “It’s a great feeling to be able to help out a deserving veteran in the community,” said Harry Brett, of Hanson, business manager of the Plumber’s Union. “It’s just an honor to be involved in something as meaningful as what this wounded warriors project is all about,” John Murphy, of Braintree, with the United Brotherhood of Carpenters. It marked the first Jared Allen Foundation project undertaken in New England. The inscription was discovered as repairs were being made two weeks after the windows had been vandalized. The house featured five-foot-wide corridors and five-foot turnaround space almost everywhere inside. Gangemi said his organization had about three dozen volunteers from the council worked on the project.